Yoga teacher, editor, and creative writing professor Melissa Carroll shares "life lessons from the lotus position"
Melissa Carroll launches her new book Going Om: Real-Life Stories On and Off the Yoga Mat in California, with stops in the San Francisco Bay Area this week. She will be visiting the Los Angeles area early next year, with a stop at Book Soup scheduled for January 13th. 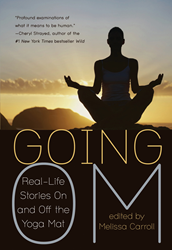 Unlike books on yoga that provide instruction on technique, Going Om is a unique collection of personal narratives from celebrated authors. Complete with a foreword by Cheryl Strayed, NY Times bestselling author of Wild, all of the essays are original material, written for this collection. Ira Sukrungruang shares his heartbreaking struggle as a 375 pound yoga student discovering self-worth on his mat; Gloria Munoz explores the practice of stillness with lyrical elegance in the midst of her busy mind; Neal Pollack’s signature sarcasm leads to surprising turns at yoga class with his dad; Elizabeth Kadetsky uses yogic wisdom while coping with her mother’s devastating Alzheimer’s. Melissa Carroll is a writer and yoga instructor who believes in the power of being present. Based in Tampa, she guides more than 200 students every week at the largest yoga class in Florida. Melissa leads yoga and creative writing retreats all over the world, and teaches creative writing at the University of Tampa. Melissa is the author of the chapbook The Karma Machine, and her work has appeared in many literary journals and magazines. Discover more and event details at MelissaCarrollYoga.com.